Nine years ago when we started this business, we had no idea how much of a role our friends and family would play in supporting us in their many ways. We are truly a ‘family-business’, as our parents help out with childcare during the holiday seasons or when we’re in the thick of it (as we’ve been the last few months building our new website and online store, writing content, developing new products, etc.). These past few weeks have been a good example of that too at the pinnacle: Late nights and long 20 hour days. A few night shifts in the kitchen. Thousands of kilometres of driving. Very little sleep. Looking back on it, it’s as much of a blur as when it was happening. 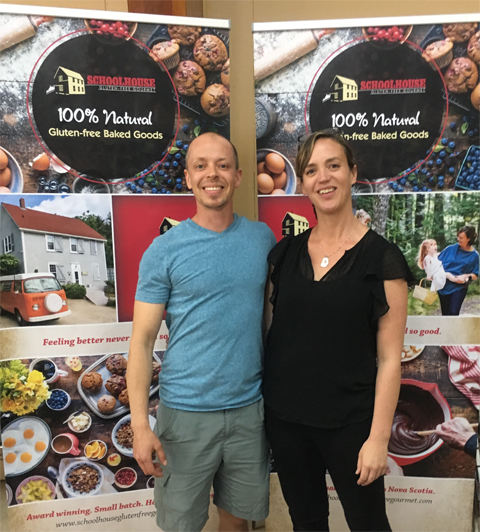 But we’re on the other side now, and are delighted with our efforts and the connections made at these special out-of-province gluten-free events. It was painful at times to make it happen, but worth it. As change and challenge always is, it’s often only upon reflection that we can see with clarity what the value or lesson learned is. How does the saying go? The best things in life aren’t free. Are we still tired though? Uh, yeah. We are lucky that both of our parents adore our twins and even though they live in Ontario, make every effort for us to all spend as much time together as possible. I mean, after all, family really is everything. 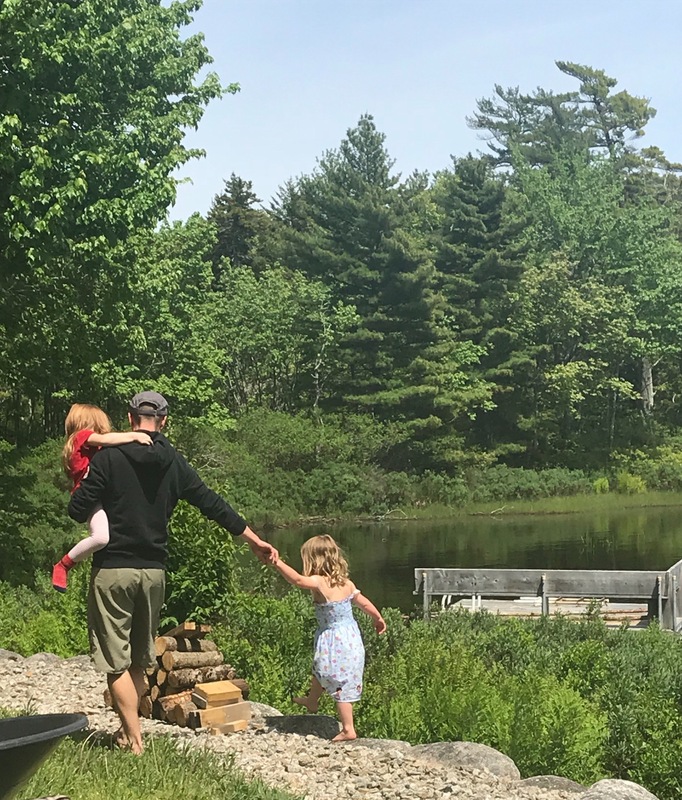 One of the greatest gifts our girls have given our family is tightening our bonds, drawing us all closer together, deepening our relationships and forcing us all to be more present, and truly understanding the preciousness of time. We live on a lake and it is Painted Mud Turtle season! The mama turtles have been looking for sandy, warm places to lay their eggs so we often find them in the yard! 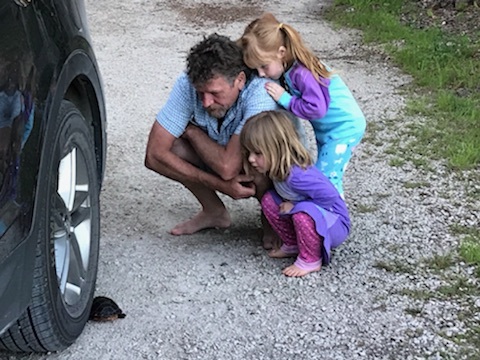 Here our brave Animal Rescuers learn from Grandpa about what it is to be a Mud Turtle. These roadtrips were the first time in a long time that Jen and I could have conversations without the yelling interruptions of “Mom! Wipe my bum!” or “Stop talking!” or “Tell me a Head Story!”. If any of you know Jen, then you’ll appreciate the file folders she had stashed in the cab of the van (and the bag of highlighters). We were like a rolling staff meeting all the way to Toronto, making the most of the idle hours. The weather was perfect; mild and cool so our Macguyvered-fridge-van of donuts arrived in perfect condition to the GTA. The only glitch was that I lost the visa when I got out for a roadside night-pee in New Brunswick on Day 1 (in such an isolated area that a moose will be the only one that finds it, although I should still call and cancel it!). The invisible string connecting all of our hearts tugged hard right out of the gate. We could all feel it and it was SO wonderful to hold our girls in our arms again. And with that, such gratitude washing over us: for our girls, for our parents and siblings and friends, for the Schoolhouse, for Nova Scotia and the life we’ve built here. And thanks to you too, for supporting our bakery and taking time to read this. It truly means the world to us. Sadie balances on rock ledge while Asha gets a ride. So much to do outside now that it is spring!